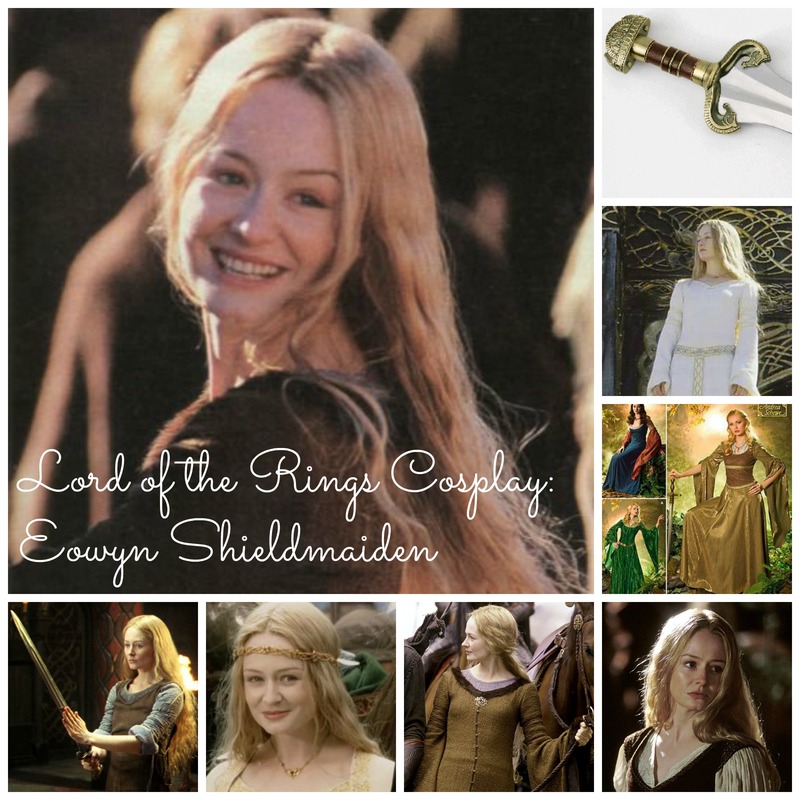 Here is the Eowyn Cosplay tutorial! I think this is my favorite cosplay I have ever done because Eowyn is my 1st of two favorite characters in the Lord of the Rings. She smiles (unlike most characters), she’s tough, and yet she’s still a graceful young woman. This was the dress I made (click here for that) and could offer the most help on. It wasn’t very difficult to make, and I used the Simplicity pattern 4940 – with a few of my own modifications. It really depends on how accurate you want your dress or if you just like the way the pattern is constructed. You can buy the pattern online (Amazon, Ebay, Sewing Patterns.com, etc.) or at your local fabric store (Jo-Ann, Hancock Fabrics, etc). 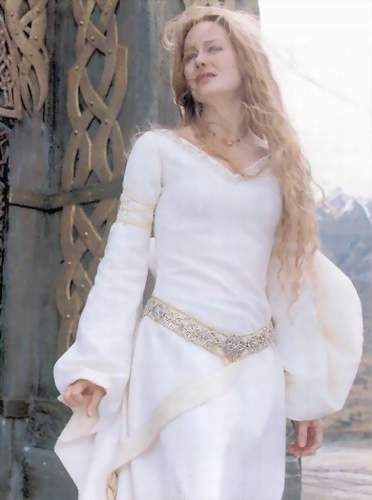 This dress is one of the more popular dresses worn in the Two Towers – for this one I couldn’t provide any help, but I did find a website called Diane’s Costumes and Research that gives a complete run through of the how-to for this dress. It was hard for me to choose either this dress or the Shield maiden. I plan to do it sometime in the far distant future. 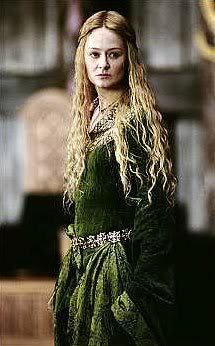 It looks like it’s made of a green velvet and has a beautiful embroidered neckline and collar. 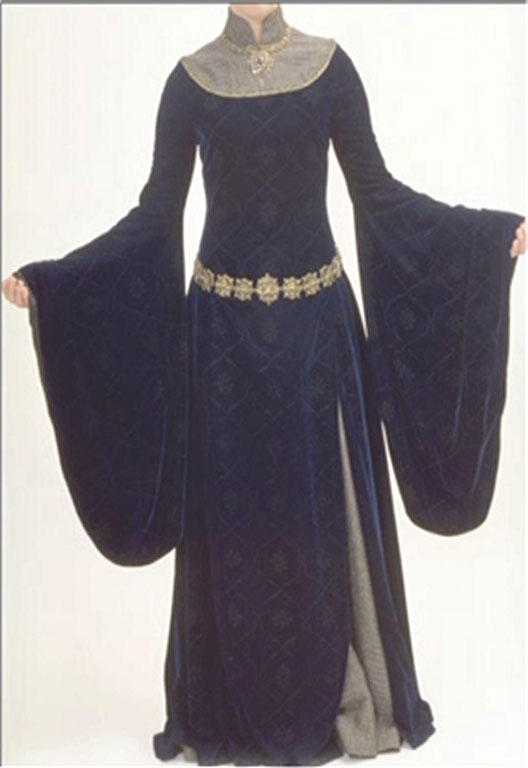 The belt is silver and the sleeves are long and flowy (what do you expect for a Middle Earth Maiden, anyway?). You could use Simplicity 4940 for this dress also (View A). The Funeral Gown is a tranquil purple color and has the same style as all the others. Except for the collar – it goes up the neck instead of stopping near the throat. You could probably use the same pattern for this dress with a few modifications for the collar. This was another hard choice when picking which dress to cosplay! Again, you could probably use Simplicity 4940 for this dress. It has a bit of embroidery and a belt on the hips. It is bound by gold twine around the tops of the arms and is a v-neck unlike the rest of the gowns. 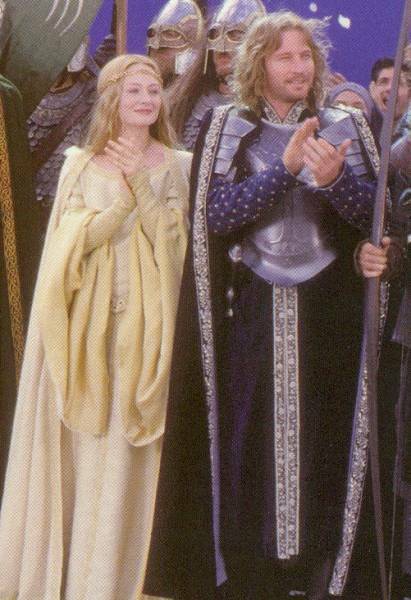 This dress is worn at Aragorn’s/Arwen’s Coronation ceremony in the Return of the King. I’m really not sure how you would make it, so if you chose this one, you would be completely on your own!! (Theme music would’ve been perfect for that) 😛 . Because a pattern was made for my dress, I used it. That is my excuse. However, for my Rey cosplay I had to put a ton of patterns together for the ensemble and for some pieces, I had to make my own measurements and designs! It really depends on how you select your dress. I encourage you to get your creative juices flowing and start from scratch (it’s funner, too 😀 ) or if you’re just starting USE A PATTERN!!! As a beginner, you will frustrate yourself and your love for sewing/cosplay will turn sour (I speak from experience). However, if you’re a bit more experienced, go for it. Go nuts. Make a mock up and test new ideas. 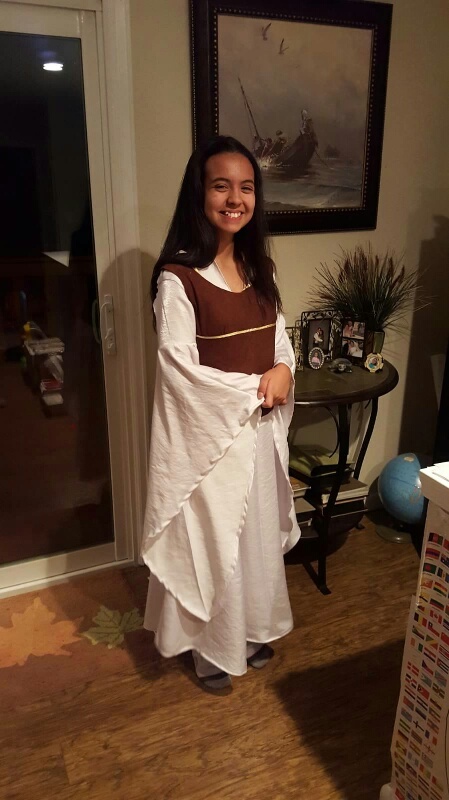 I used a mock up for my Tauriel bodice with old scraps (to test my theory first) and then once I had the design firmly set, I bought some leather look and made the official. A mock up is the easiest way to go about when brainstorming for your own, original, pattern-free cosplay. 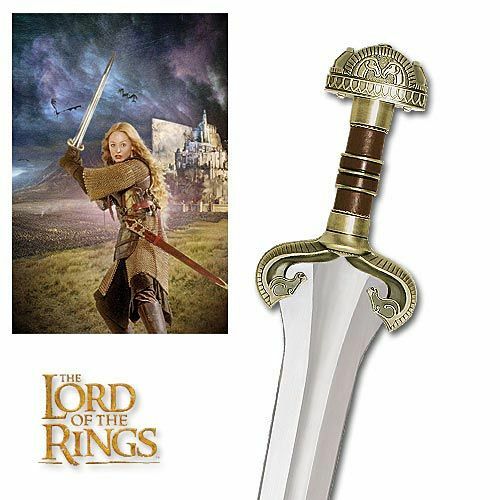 The one and only and (in my personal opinion) most awesome accessory is her sword – the sword that slayed the King of the Nazgûl! I loved that scene – she’s so awesome. This picture shows the detail on the sword – the horses are just my thing (another reason to love her). The hilt is decorated in the fashion of the Rohirrim; honoring their horses and it just looks rustic. 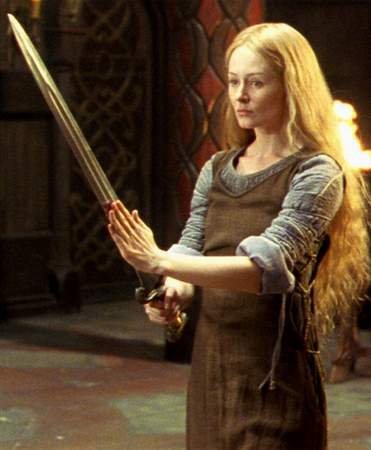 Eowyn wields her sword at The Battle of Pelennor Fields in the Return of the King. It is also pictured in the photo of the Refugee Gown. The sword goes for $349 on United Cutlery. For the other props, you’d have to buy them on Etsy or someplace similar because they don’t exactly sell Eowyn belts at the store! So, my friends, I do believe this concludes our 4th cosplay tutorial together. I hope you all find it helpful! And please, do not hesitate to ask questions in the comments log! I’d be happy to answer them for ya!